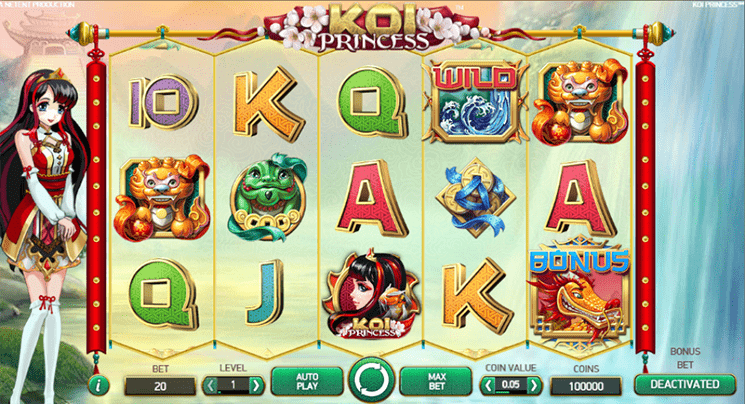 Koi Princess is standart 5 reel, 20 payments video slot powered by Net Entertainment. 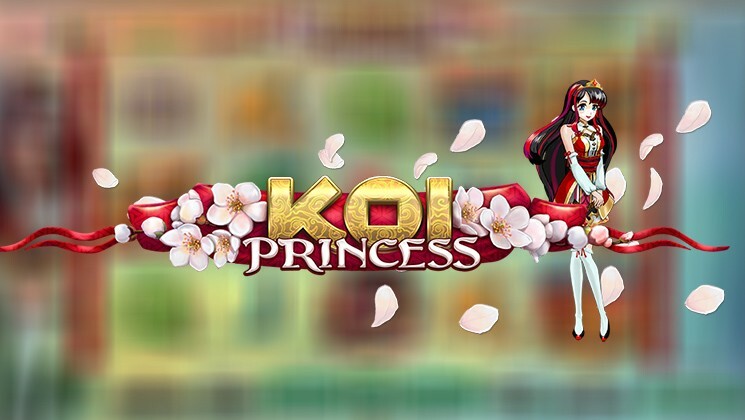 Koi Princess slot is heavily influenced by Japan and anime theme with suiting music on there background. Low paying symbols are traditional 10’s – A’s whereas high paying symbols are five game related symbols. Wild symbol is represented as a woodblock with the Great Wave of Kanagawa printed on it. Before investing real money players can try Koi Princess Slot for free, or visit any NetEnt casino such as: Wixstars Casino, MrGreen Casino, Grand Ivy Casino and others to play with real money and win. Before you start your Japan adventure, you need to place bets. To adjust worth of the coin, press “Coin Value”, in addition using “Level” button you can set number of coins per line. If you want to start the game with already highest bet amount click “Max Bet” button. To set number of spins that will go without stopping use “Autoplay” where “Spin” is a start button. In addition there is a special “Bonus Bet” button which increases your winnings during bonus or random features. Koi Princess have plethora of features for you to enjoy. Slot consist of 4 random features and additional 4 bonus features. Random features are 5-hit, Random Wilds, Bonus Game activation and Wild Reels. Bonus features include Three Bonus, Sure Win, Bonus Wheel and Coin Win. The 5-hit Random feature awards you with one free spin with guarantee win. During Random Wild feature reels are covered with additional 4 or more Wilds. Wild Reels feature give players one free spin where 2 or more reels are fully covered with Wilds and Bonus Activation feature places 3 bonus symbols on first, third and fifth reels activated additional four bonus features. Sure Win feature awards you with 10 free spins. Wild Reels Free Spins feature also awards you with 10 extra spins, but for each spin one of the reels will be covered with Wilds. Coin Win Bonus feature awards the player with an instant coin win.